Huong Truong is a senior manager of BGA’s Vietnam team. She provides analysis and briefings on legal and policy issues and supports clients in stakeholder mapping and network development. Before joining BGA, Huong managed the Joint United Nations Program on Green Production and Trade in Vietnam. The program provided support to generate income and employment for thousands of farmers and small and medium enterprises in northern Vietnam. The program was considered one of the most successful joint UN programs implemented globally. Huong has nearly a decade of experience in working for international development projects funded by different donors including the Japan International Cooperation Agency, the European Union and the United Nations. She worked in areas ranging from primary education to the World Trade Organization and international trade policies and handicraft sector development. 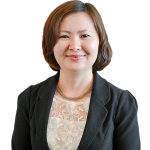 Huong earned a bachelor’s degree in international relations from the Diplomatic Academy of Vietnam in 2003 and a master’s in development studies from the University of Melbourne in Australia in 2009.